Hong Kong election reform proposals that sparked massive street protests last year in the southern Chinese financial center are set to be presented Wednesday to lawmakers, who will likely vote them down. The proposals tabled for a legislature debate would allow the former British colony’s top leader to be chosen by voters through direct elections rather than by a 1,200-member panel of Beijing-friendly elites. But under guidelines laid down by China’s central government, voters would only be able to choose from a set of candidates screened by the panel. 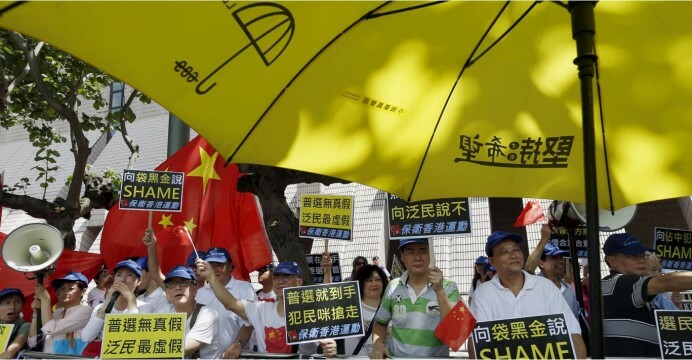 Pro-democracy leaders have blasted the plan as “fake democracy,” saying the central government is breaking its promise to eventually grant genuine universal suffrage to the city, a special administrative region of China. Hong Kong’s government needs the support of at least two-thirds of the 70 lawmakers, or 47 seats, to win approval when it goes to a vote, which is expected by the end of the week. But lawmakers from pro-democracy parties, who hold 27 seats, have vowed to use their power to veto it. They entered the legislature chamber with mock ballot boxes each marked with an X, signaling their intention to vote against the plan. The looming defeat would mark the close of the most tumultuous year in Hong Kong since Beijing took control in 1997 after a century and half of colonial rule. Tens of thousands of people took to the streets last year to protest the central government’s election screening requirement in demonstrations that made world headlines. For 11 weeks, activists camped out on major thoroughfares in three neighborhoods to demand greater electoral freedom but eventually left the streets after exhaustion set in and Hong Kong’s unpopular leader, Leung Chun-ying, refused to offer any concessions. Authorities are bracing for the possibility of violent protests as the vote nears, though that prospect may be overstated given the likelihood of a defeat for the government. Legislature officials have raised the alert level and authorized police to deploy inside the building. A police risk assessment indicated “a likelihood of the Legislative Council complex being stormed by radical groups in the next couple of days,” legislature president Jasper Tsang said Tuesday.